What's new in Visual Studio 2017? What is the system requirement for Visual Studio 2017? Which are the SharePoint versions supported by Visual Studio 2017? Which edition of Visual Studio 2017 should I download? On March 7 and 8, 2017, Microsoft celebrated 20 years of Visual Studio and announced the release of Visual Studio 2017. What platforms is Visual Studio 2017 targeting? When you first install Visual Studio 2017, you'll have a brand new experience. Visual Studio Enterprise and Community (among other products) can now be installed side-by-side on the same computer, and you can identify these installations by specifying a short name or "Nickname". For example, if you were to install Visual Studio Enterprise, and then install Community, both would appear the same on the Start menu. You can give the second one a nickname like "community", and the Start menu items will appear with names such as "Visual Studio 2017". The smallest install is just a few hundred megabytes. Visual Studio has been optimized to reduce startup time and solution load time. The very first launch of Visual Studio is at least 50% faster. Visual Studio will now monitor extension and tool windows performance that impacts startup, solution load, or editing. You will receive alerts about poorly performing extensions via the Notification bar in the IDE. Help > Manage Visual Studio Performance. Reload All Projects has been replaced with Reload Solution to support better performance when switching branches external to VS. 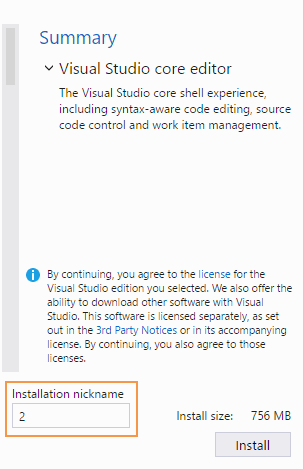 The GitHub extension can be selected in the new Visual Studio installer. It is now available by installing the Help Viewer component from the Visual Studio installer. You are now automatically taken to the folder view of your repository after cloning. To keep track of uncommitted and un-pushed work. You can now add and remove multiple user interface languages at any time using the Visual Studio installer on the Language Packs tab. Tools > Options > International Settings. Go To All. (Ctrl +, or Ctrl + T) lets you quickly find and go to files, types, methods, and other elements in your code. Go To Line. (Ctrl + G) experience. You can find the "Go To" family of commands at the top of the Edit Menu. Providing advanced grouping, filtering, sorting, searching within reference results, and colorization for results (for C# and VB). Select a reference, then click Shift+F12 to get results. Structure Guidelines is enabled by default for several languages. With this feature, vertical lines appear in the editor that line up with structured code blocks. Tools > Options > Text Editor > General category > Unchecking the Show Structure Guidelines. To work with code bases without projects and solutions. Enables faster loading of large Solutions. The feature can be turned ON and OFF for individual Solutions in the Solution Properties Pane. Tools > Options, select "General" under "Projects and Solutions". Connected Services is the modern "Add Connected Service" or "Add Service Reference" feature of Visual Studio 2017. If you can't find the templates you’re looking for, the Visual Studio Installer can also be opened from within the New Project dialog. Enables you to filter the member list by type (e.g., methods, properties, classes, etc.). Tools > Options > Text Editor > [C# / Basic] > IntelliSense and check the options for filtering and highlighting. Enabled by default to provides richer IntelliSense and adds IntelliSense support. No longer set temporary breakpoints or perform several steps to execute your code and stop on the line you want. Simply click the icon next to a line of code while debugging to run to that line. Easily search in the Attach to Process dialog to quickly find the process you want to attach the debugger to. You can now quickly (Shift+Alt+P) reattach to processes you were previously debugging. In my opinion, it's a great feature for SharePoint Solution Debugging. When you configure the debugger to break on thrown exceptions, you can add conditions so that the debugger will only break when exceptions are thrown in specified modules. By default, the Diagnostic Tools window opens automatically when debugging. In the Options -> Debugging -> Uncheck Enable Diagnostic Tools while debugging. Debug -> Windows -> Show Diagnostic Tools. English, Chinese (Simplified), Chinese (Traditional), Czech, French, German, Italian, Japanese, Korean, Polish, Portuguese (Brazil), Russian, Spanish, Turkish. 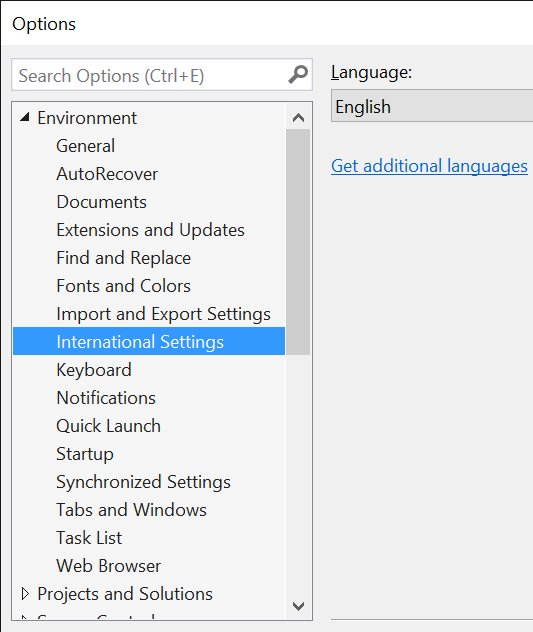 You can select the language of Visual Studio during installation. The Visual Studio Installer is available in the same fourteen languages and will match the language of Windows, if available. Visual Studio Team Foundation Server Office Integration 2017 is available in the ten languages supported by Visual Studio Team Foundation Server 2017. 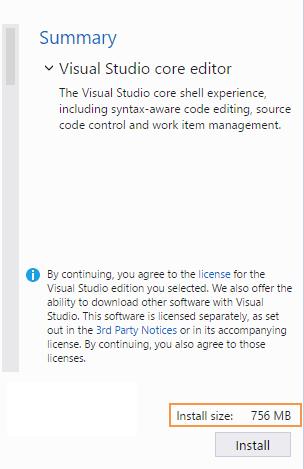 .NET Framework 4.5 is required to install Visual Studio. Visual Studio requires .NET Framework 4.6.1, which will be installed during setup. For more details, check Visual Studio 2017 Product Family System Requirements. Compatibility with previous Visual Studio. .NET 4.6.1 is a highly compatible in-place update of .NET 4, .NET 4.5, .NET 4.5.1,.NET 4.5.2, and 4.6. .NET 4.6.2 is included with Windows 10 Anniversary Edition, and is a highly compatible in-place update of .NET 4.6.1. Compatibility for Team Explorer and Team Foundation Server. and Team Foundation Server 2010 SP1. For more details, check Visual Studio 2017 Platform Targeting and Compatibility. Visual Studio 2017 supports SharePoint 2016, SharePoint 2013 and Office 365. Open the Visual Studio Installer > Click on Modify Button. For more details, check Missing Office / SharePoint template in Visual Studio 2017. Free, fully-featured IDE for students, open-source and individual developers. Free download. Professional developer tools, services, and subscription benefits for small teams. Free trial. An end-to-end solution to meet demanding quality and scale needs of teams of all sizes. Free trial. Visual Studio 2017 has landed. Visual Studio 2017 Product Family System Requirements. Visual Studio 2017 Platform Targeting and Compatibility. Missing Office / SharePoint template in Visual Studio 2017. Visual Studio 2017: Install and Use GitHub Extension. Visual Studio 2017: New Installation Experience.